Since 2007, Fremont Street — and especially the Fremont East district — has seen substantial growth. This mostly means new bars, watering holes, lounges, clubs, drinking establishments… whatever you want to call them. Naturally, at Vegas Pub Crawler, we say the more the merrier. Not only does this give our crawlers more locations to explore, it gives them more drink options. In the never-ending goal to offer patrons better and more interesting drinks, many Fremont bars are expanding their menus. Sure, you can still get a Pabst Blue Ribbon anywhere (PBR has become the unofficial standard beer of Downtown Las Vegas), but the following bars offer unique cocktails and/or craft beers that will make your excursion more memorable, as long as you don’t chug too many. This somewhat hidden lounge is the kind of place that’s so dark inside, it’s difficult to read the ingredient list for the drinks. Luckily the servers are equipped with mini flashlights. It may be dark, but the intimate, bohemian décor is warm and inviting when you’re looking for a relaxing place to drink. Some highlights include The Bitter End (Amaro, Oloroso, All Spice — traces of sweet caramel, spice and a bitter finish) and Nutso Nymph (Vermouth, Absinthe, Walnut, Cookie — flavors of smooth walnut and anise that finish dry, buttery). This unique gastropub offers innovative bar fare and an eclectic art collection. Park features both a laid-back indoor dining area with antique tables as well as a lush outdoor patio that is often referred to as the “beer garden.” It’s the kind of place that’s surrounded by a white picket fence yet still at home on Fremont. Some of the delicious craft beers on tap include Dogfish Head IPA and Deschutes Chainbreaker White IPA. 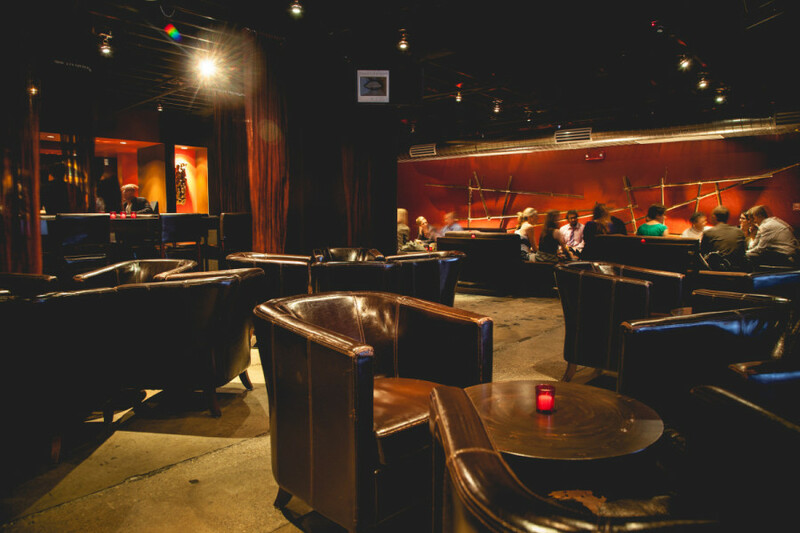 This artsy lounge features creative drinks served in a dark, bohemian atmosphere. Artifice is located at the heart of the Downtown Arts District, complete with artwork from local artists on its walls as well as two separate lounges and a stage where you can watch bands and live performances. However, Artifice’s signature cocktails are the reason we keep coming back. These include whimsically named drinks such as The Warhol, Taming of the Shrew and the Nicky Free. 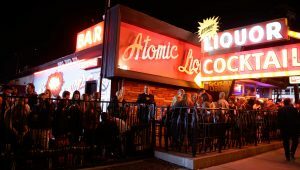 This classic is the oldest freestanding bar in Las Vegas, but don’t let it’s age fool you, Atomic’s swanky, retro allure and landmark neon sign are just as cool as they were 50 years ago. 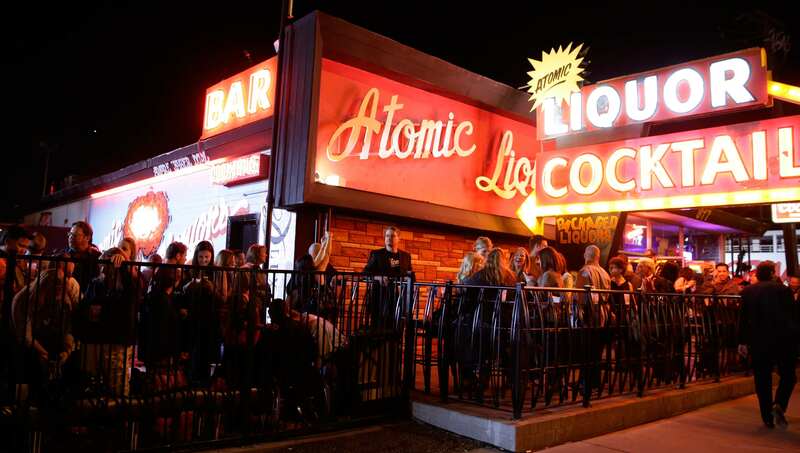 Atomic has served a host of celebrities in its time, including The Rat Pack and Barbara Streisand. Don’t get too caught up in the glitz and glamour and forget about the drinks! Atomic has over 20 microbrews on tap as well as their signature atomic themed drinks. 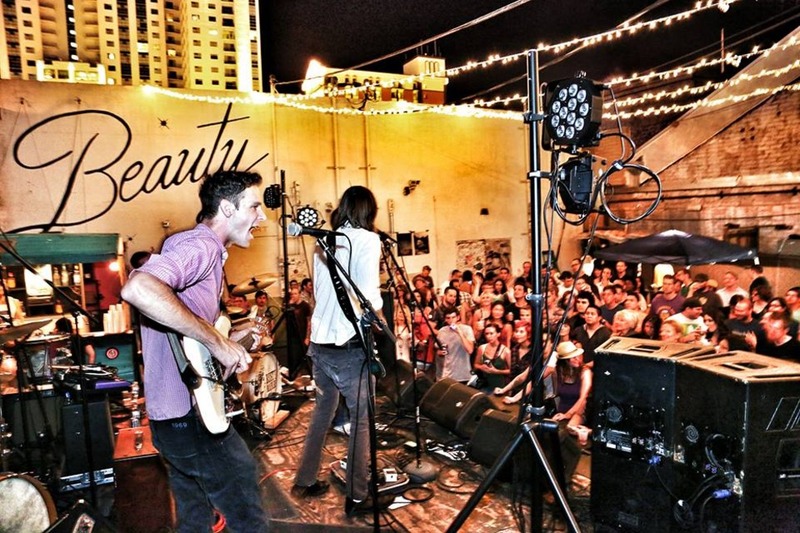 Be sure to check these places out when you indulge on your next Vegas Pub Crawler session!